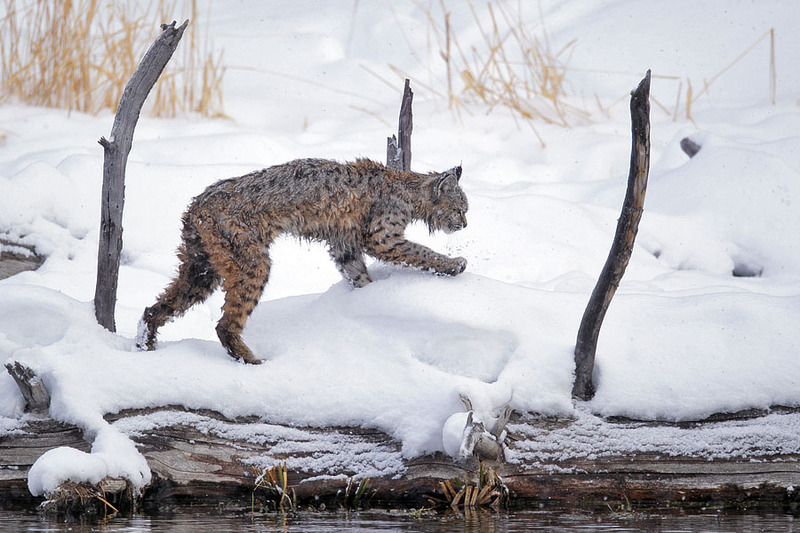 I’ve just returned from 2 weeks in Yellowstone National Park leading my annual winter photo tours. I had 2 great groups and we worked as hard as we could to capture memorable images. If there is one thing I’ve learned about Yellowstone National Park in the 30 years I’ve been photographing there is that every year is different. Last year was probably my best year ever for wolf photography but this year we only had one brief chance to photograph wolves. Red fox were scarce and we saw less coyote than in previous years but as you can see by the above image we had a great bobcat photo opportunity. I would say the snow levels were somewhat below average and temperatures were above average. As usual the interior of the park was beautiful and it was very quiet with seemingly few winter visitors. We captured this hunting coyote along the Madison River on one of our chartered snowcoach trips into the interior of the park. 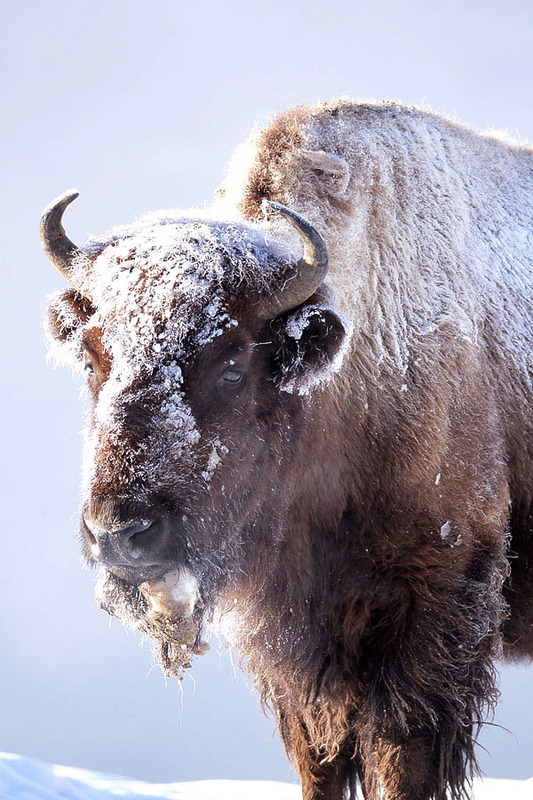 This frosty bison was photographed near Roaring Mountain on a cold morning in the interior. 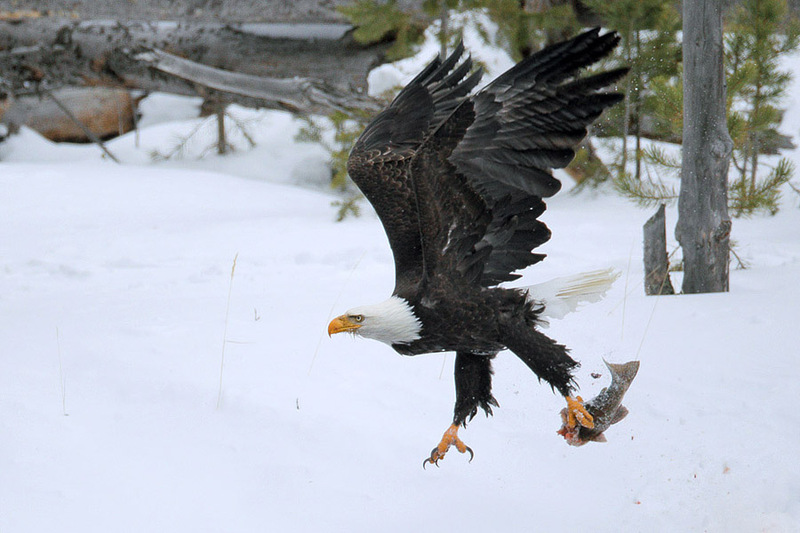 We found this bald eagle eating it’s breakfast along the Madison River. I captured this image handholding my EF800mm F5.6L and Canon 1D mk4. Having preset my ISO to 800 for the light conditions I was able to achieve a high shutter speed to freeze the action as the eagle took off. While photographing trumpeter swans on the Yellowstone River I heard the distinctive whistling wing beats of an approaching goldeneye and was able to quickly achieve focus on this beautiful drake. 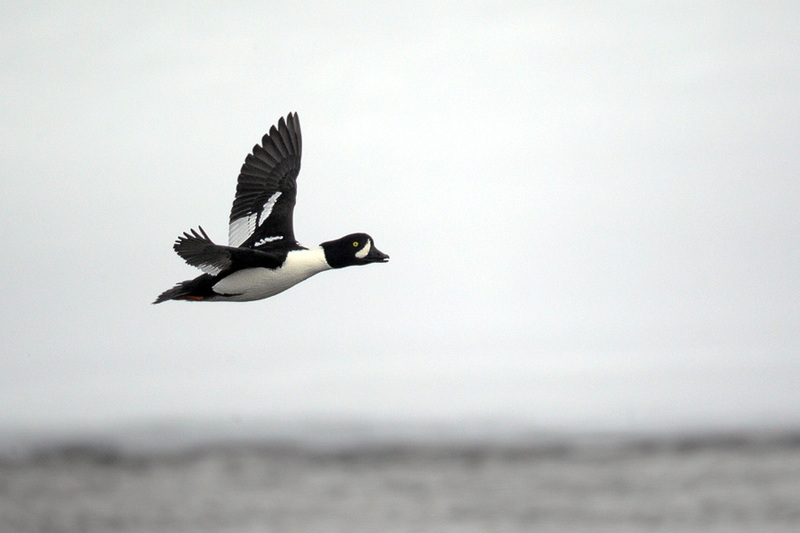 I was again handholding my 800mm lens and 1d4 to capture a nice series of this rarely seen duck in flight. 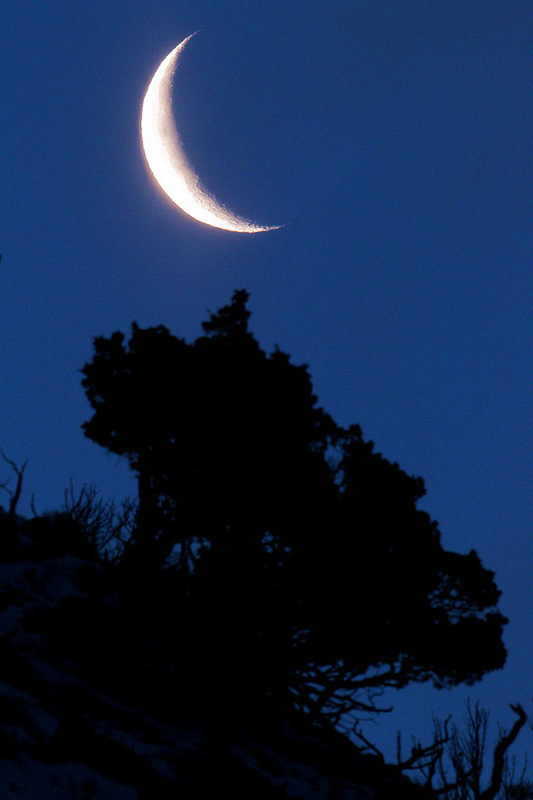 One morning driving into the park from Gardiner I noticed the crescent moon setting over the canyon rim. I quickly found a pull off and we did our best to capture this striking scene. DOF problems made it difficult to achieve sharp focus on the FG tree and the moons so I advised the group to make a sharp image of the tree and another with the moon in focus and then combine in the images in post processing. This image was a single image where I stopped down as much as I dared (1/15th @ F16) to try to get both principle elements in focus. Shooting with my 800mm lens the DOF was very shallow and I didn’t quite get the tree as sharp as I would have liked. 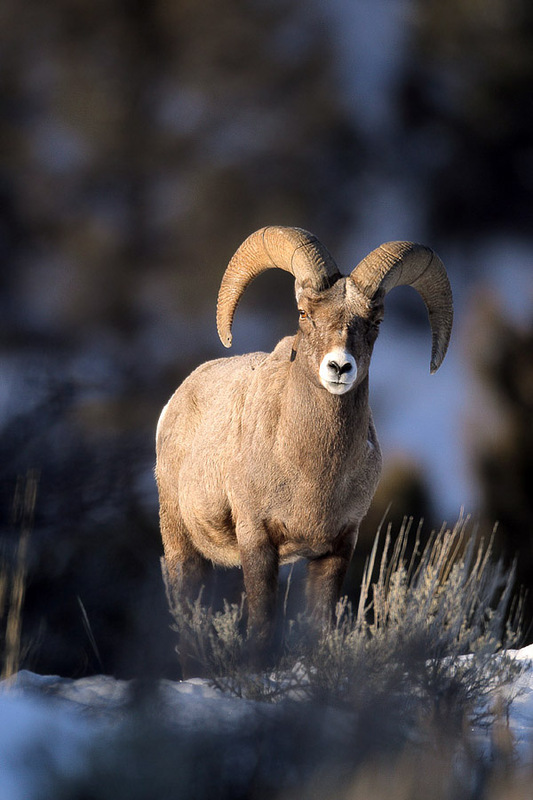 On a beautiful sunny morning we found a pair of bighorn rams along the Yellowstone River near Junction Butte. For this image I noticed the ram was in spot light. I really love this kind of lighting. I found some out of focus FG vegetation and shot right through it to highlighting the ram even more. very nice photos of the crittors, that duck was really nice, are they rare that time of year there? that ram looks really healthy. that poor coyoto look more like a fox then a coyote. we saw a couple once when hiking a trail and I was uaware of how big coyotes were. there as big as my neighgors german sheperd she used to have and he scared me. but he was gentle. Beautiful!!!! The bobcat looks like a prehistoric creature!!!! 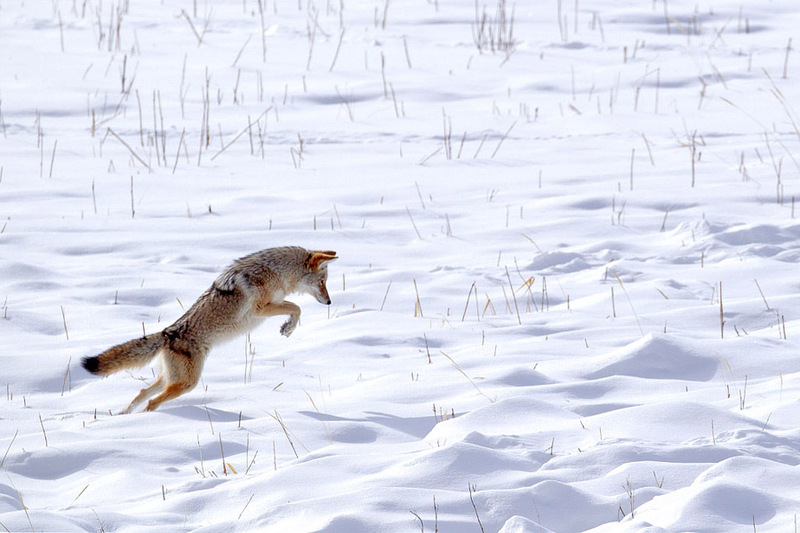 Awesome……Thank you for sharing these wonderful glimpses of nature..
All beautiful but I really liked the action shots – especially the coyote. amazing photo’s! I think the bobcat one is my favorate. “nature is beautful in all its ways!” -one of my nature jornals.